New Jersey Sen. Bob Menendez appears to be the focus of a criminal investigation that also resulted in a raid last month against an eye doctor accused of lavishing the Democrat with gifts and young prostitutes, two bureau sources told the Daily Caller. The Caller wrote that the FBI’s inquiry has changed focus to New Jersey from Miami, where the doctor is based, suggesting Menendez is the ultimate target. 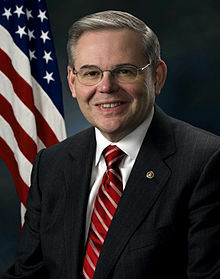 Menendez has forcefully denied any involvement with prostitutes of any age, though he recently reimbursed Melgen $58,500 for two private jet trips to the Dominican Republican in 2010. The probe began in Miami. Menendez has adamantly denied any wrongdoing. Posted: 2/7/13 at 9:45 AM under FBI, News Story. The Bureau says they are not politically motivated and politics don’t play a part in their decisions. In fact politics play a huge role in DOJ. The US Attorney is appointed by the President the Attorney General, again appointed by the president. The Director of the FBI, well he got a 2 year extension on his career and again, is appointed by the president. DOJ is corrupt. Plain and simple. Decisions are clearly politically motivated. Not by the agents who are working the case putting in 14 hours a day to do the right thing, but by DOJ main justice and the US Attorney’s Office they are working with. Good luck to anyone who ends up in their cross hairs!